Book: Cold, Crunchy, Colorful: Using Our Senses by Jane Brocket. Large, colorful pictures and a simple text makes this book a great one for sharing with a group. It talks about the five senses (sight, touch, smell, taste, and hearing) and things we can experience with our five senses. This is a great book for introducing some new vocabulary! Felt: The four tastes! I am a lucky girl that Miss T did the five senses for her Toddler Times last week, so she had already made all my props. 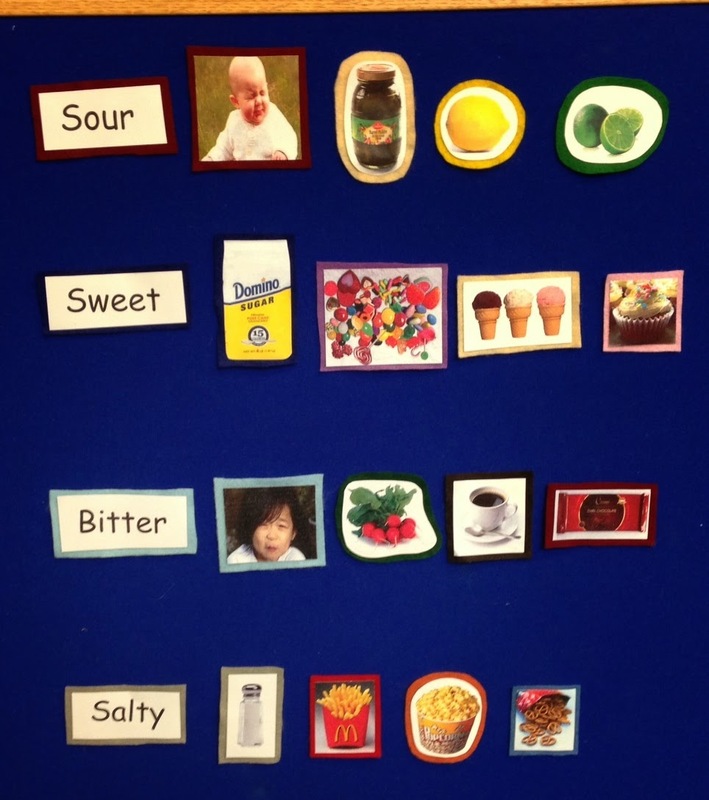 For this felt, I put up each tasting word (sour, sweet, bitter, and salty) with one picture to remind us which one it is (salt shaker, bitter & sour faces, and sugar). Then I held up the rest of the pictures one at a time and asked kids where I should put them. Bitter was hard (probably these kids have not tasted much bitter stuff! ), but they got all the rest with flying colors! Book: Shark in the Park by Nick Sharrat. This is a fun story for talking about sight. Timothy Pope keeps thinking he sees a shark in the park through his telescope, but it keeps turning out to be something different. I made this participatory by asking the kids to use their hands to make their own telescope and we all looked up at the sky, down at the ground, left, right, and alllll around! This is a short, funny story and a crowd-pleaser. Book: Rain by Marya Stojic. This is another book that uses all five senses as different African animals wait for rain to come. Closing Song: Do You Know What Time It Is? Before we go into the closing song, I explain the stations briefly and encourage grownups to accompany their children and talk with them, using lots of different words to describe what they're sensing. Short and sweet this week = just what I needed! Touch. 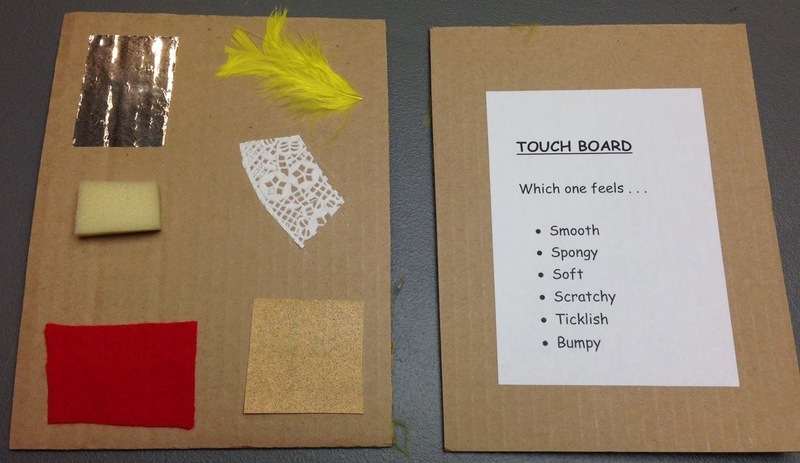 Miss T made these touch boards to use with her toddlers. She cut out small pieces of cardboard and glued different textures to one side and a list of words on the other side. The touching side has aluminum foil (smooth), a feather (tickly), a sponge (spongy), lace (bumpy), felt (soft), and sandpaper (scratchy). Mystery Boxes. Miss T also turned empty tissue boxes into mystery boxes. The idea is that kids will stick their hands in and try to tell by touching what's inside. If kids pull it out to look at it, that's okay, too. They're using their senses of touch and sight together to figure out what's inside. Smelling Bottles. Miss T used little spray bottles and put a cotton ball soaked in extract in each one. 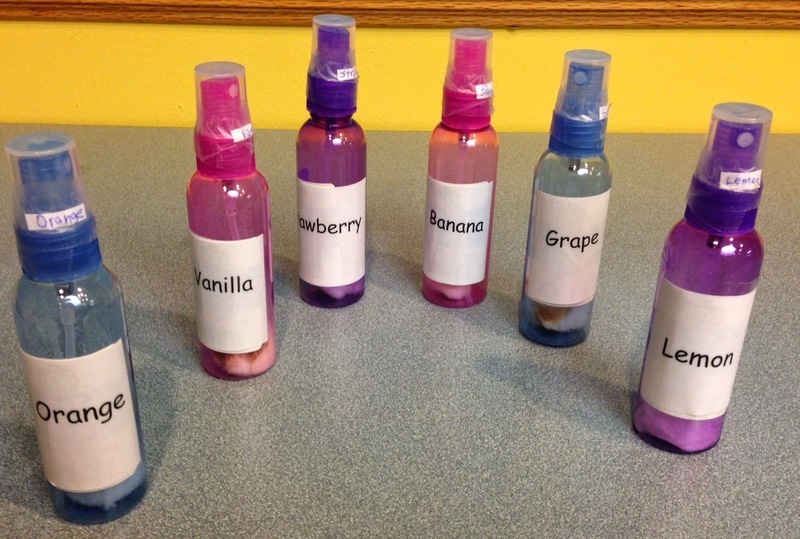 She used orange, vanilla, strawberry, banana, grape, and lemon extracts. Since she was using them with the younger kids, she kept it to nice smells. Other ideas: coffee, spices, dirt/mud, etc. And that was it for this week! We had a big crowd - 28 kids with siblings counted - but the stations were simple and pretty quick and that made things go really smoothly. Of course I had a book display and their take-home packets. We're halfway through our summer Preschool Labs! Your Librarians Are Reading, Too! Fizz Boom Read: Self-Directed Science Activities!